Let's move on to something more pleasant. Sort of. Tomorrow is Free RPG Day! For the first time I am, in a small way, involved; among the products being given away by participating shops is a monster book published by Lamentations of the Flame Princess, the publisher that doesn't do monster books, apart from this one and the other two. It's called Slügs! because all the monsters are slugs. I drew most of the slugs, and wrote a little bit about one of them. It would be brilliant if you pick up a copy of Slügs! tomorrow, but the idea behind the event is to get people into games shops to buy and play, and to build a community. When you do pop in, mention why you're there so the shop staff know what you're interested in and what to order in the future; at the very least they will know that Free RPG Day works and will be more open to participating in future. Have a chat with the people there. Find out what they're playing, tell them what you're playing. Make some contacts, perhaps try a new game. Buy something too, even if it's just some dice. You can never have too many dice, yes? I woke up this morning worried about my country. For those not aware, next week we vote on whether the United Kingdom should remain part of the European Union or if it should leave. As of this morning, polls suggested a victory for the leave campaign; that's what had me worried. The campaign has been a shameful mess, with both sides wailing and gnashing and scaremongering, drowning out those who would try to present the facts. Underneath everything there seems to be a deep-seated distrust of foreigners, whether it's "unelected" European bureaucrats or waves of refugees migrants. It's ugly, and it hasn't shown the British people, media, or politicians in a good light. Yesterday, there was a ridiculous display as a failed politician -- supporting the leave campaign -- and a grumpy old musician -- representing the remain camp -- had a little naval engagement on the Thames. It was absurd and embarrassing, and seemed the perfect encapsulation of what a shambles the whole referendum has become. Meanwhile, there's some sort of sporting tournament happening in France, and the good old English fans are chanting about leaving the EU during the matches, and then are smashing up French towns afterwards. Oh, and they're abusing refugee children in the street. Great job, lads. I'm not one for feeling national pride; in fact I'm a bit distrustful of and uncomfortable around it, and I don't really identify with any country. It's just some dirt you live on, after all. That said, yesterday I did feel national shame. Then today some wazzock shot and stabbed MP Jo Cox while she was meeting her constituents, shouting "Britain First" as he did it. In the coming days we will discover if the murderer is in fact connected to the subliterate hate group of that name, or if it's just a depressing coincidence. Either way, a woman was killed by stupid, ugly nationalism today. I woke up this morning worried about my country. I go to bed tonight disgusted by it. 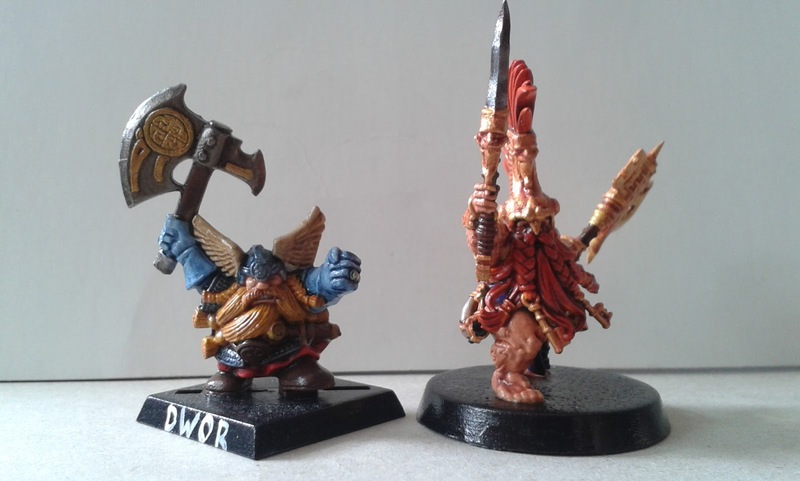 On the left, the dwarf from 1995's original Warhammer Quest. On the right, the dwarf duardin™ fyreslayer™ from 2016's Warhammer Quest: Silver Tower. Someone's been drinking his milk!